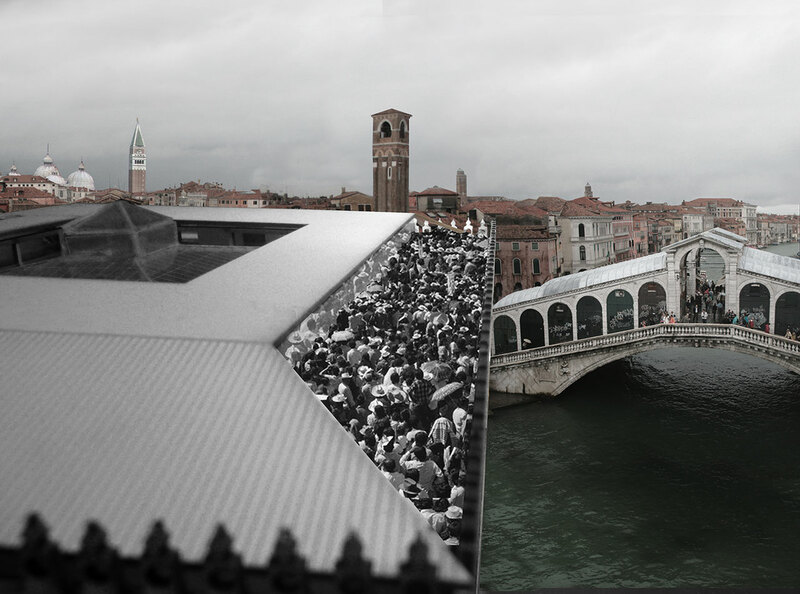 Photo by Delfino Sisto Legnani and Marco Cappelletti © OMA. Architecture Practice OMA Area (sqm) 9000 Client Edizione S.r.l. Venice is known for its romantic gondola's floating on the intricate, water roadways which surround the medieval city's stunning, partially sunken buildings. One such building, the Fondaco dei Tedeschi, located beside the Rialto Bridge, bears witness to the city's rich history and stands as a signpost for locals and tourists alike. Originally constructed in the 16th century by German traders as a warehouse, the Fondaco has since become a city legend and undergone many metamorphoses, most recently being established as the post office in the 1900's. One hundred years later, it was due for another transformation. So, when one of Italy's prominent families, Benetton, purchased it they unsurprisingly had a completely different vision for it: to create a thoroughly modern department store unlike any other, which seamlessly combined commerce and an urban recreational lifestyle. 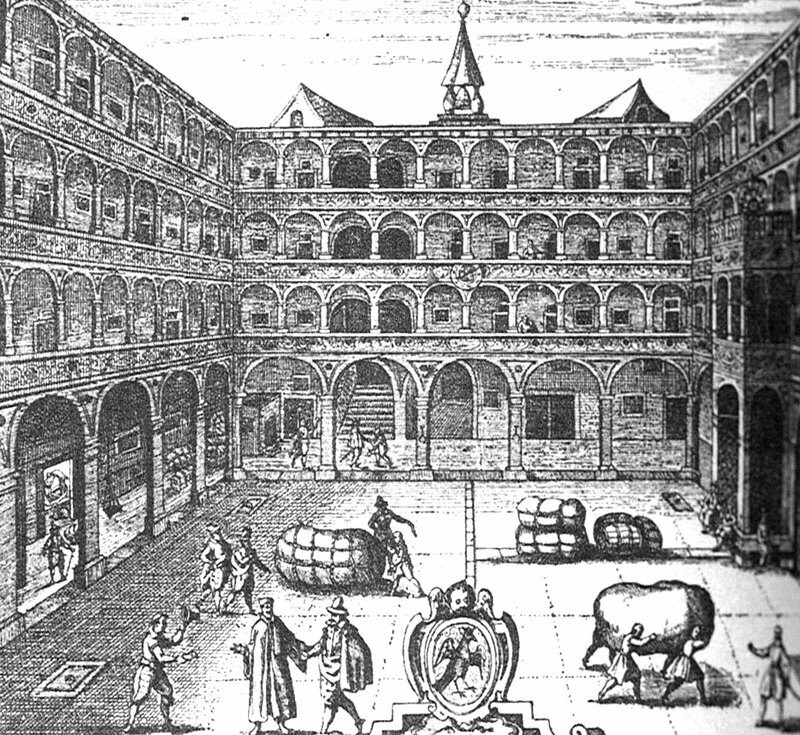 Engraving of trading activities at the Fondaco by Rafhaele Custos, 1616. Image courtesy OMA. Il Fondaco dei Tedeschi, reconstruction of the loggia’s vaults, 1930s. Image courtesy OMA. Il Fondaco dei Tedeschi, location next to the Rialto Bridge on the Grand Canal. Image courtesy OMA. 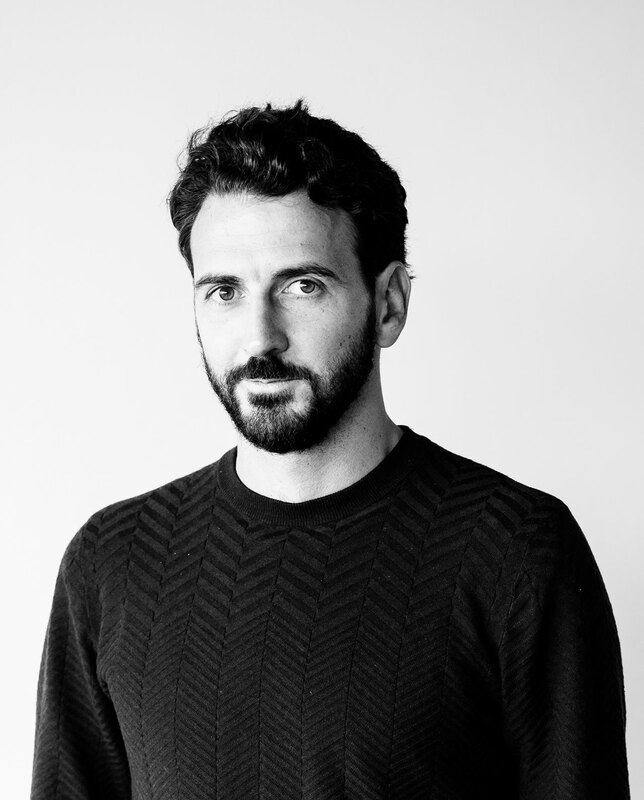 Turning to OMA, the "modern legend" architecture firm responsible for incredible ventures such as the Fondazione Prada in Milan, the Benetton family felt assured that their recent purchase was in entirely capable hands. The impressive project -- which began in 2009 and was led by OMA partners Rem Koolhass and Ippolito Pestellini Laparelli and project architects Francesco Moncada and Silvia Sandor -- has recently been completed and has already become a part of the city’s vibrant present day while still reflecting the best of the city's yesterdays. 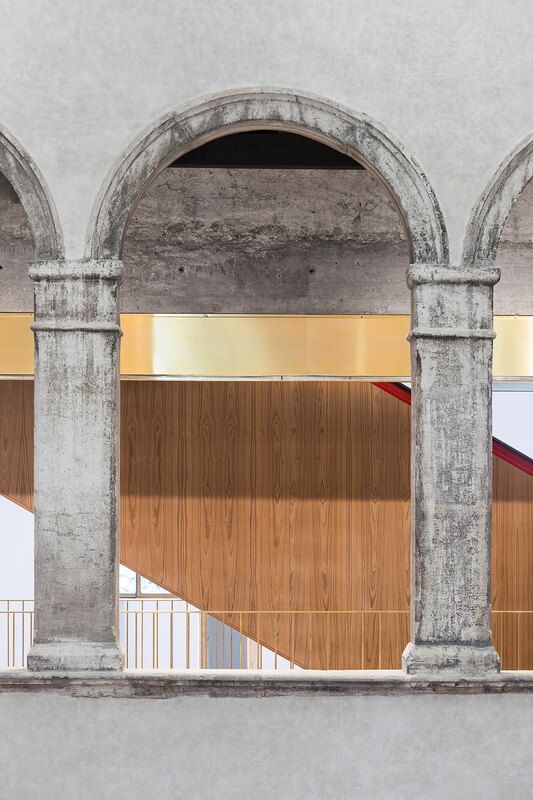 Yatzer spoke to Silvia Sandor about the Fondaco dei Tedeschi's innovative reincarnation, the arduous renovation process it took to achieve it, and what exactly the building means to its home city. What are the particular intricacies that you had to deal with in the renovation of not only such an old building, but one that had already been interfered with so many times over the last five centuries? How did you work around its official “Monument” status? 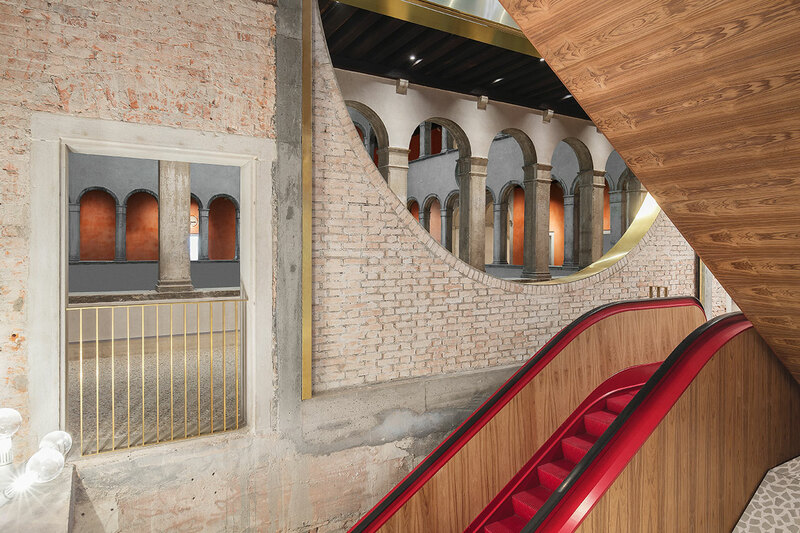 The challenge we faced in Venice was transforming a former 16th century German trading warehouse into a contemporary department store. A building that went through five centuries of transformations and adaptations from its original commercial function, to a customs office during the 18th century and post office in the 1900’s. 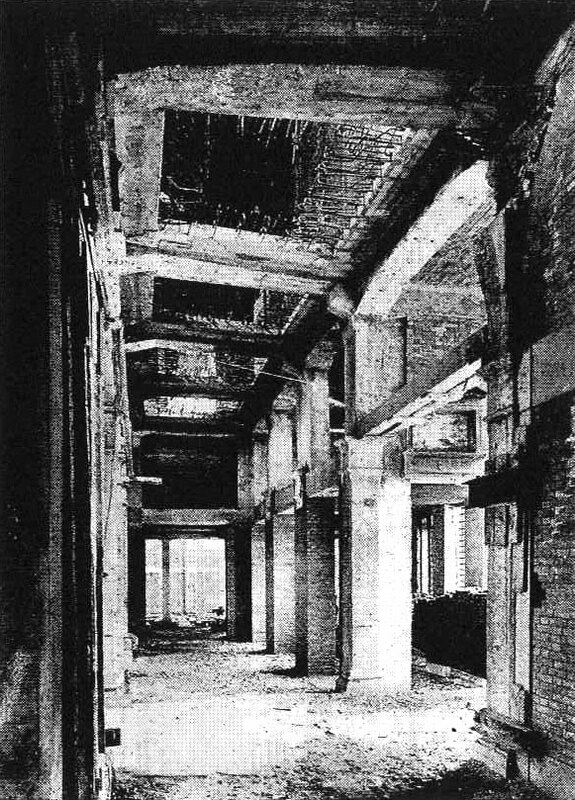 In 1938, due to the severe deterioration of its structure, the Fondaco went through an intense consolidation process and was almost entirely reconstructed with modern concrete technology. Despite the lack of authenticity, its official “Monument” status denied almost any transformation. 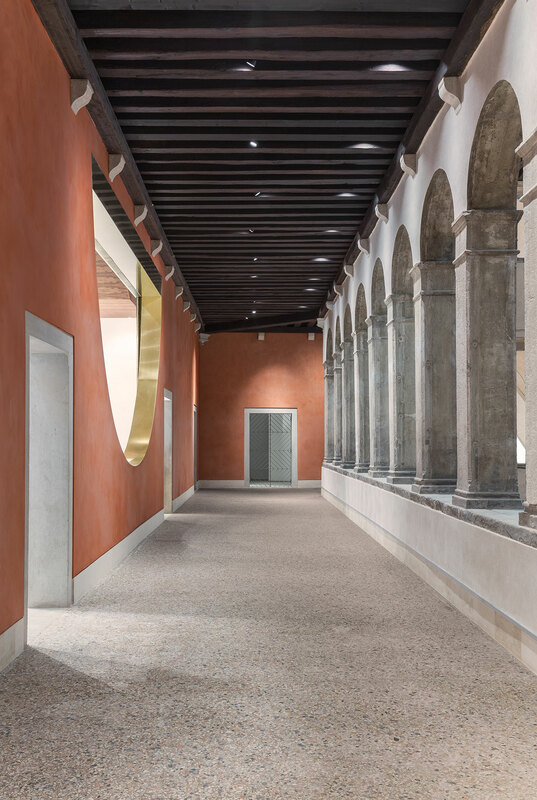 The Fondaco’s renovation scheme is the outcome of a complex process which can be summed up in six years of creative negotiation with local authorities, national heritage institutions and local citizens. It consists of a number of specific interventions that support the new commercial program and define a sequence of public spaces open to the city. Ultimately, each intervention attempts to reveal the real substance of the building and the layers of its history. 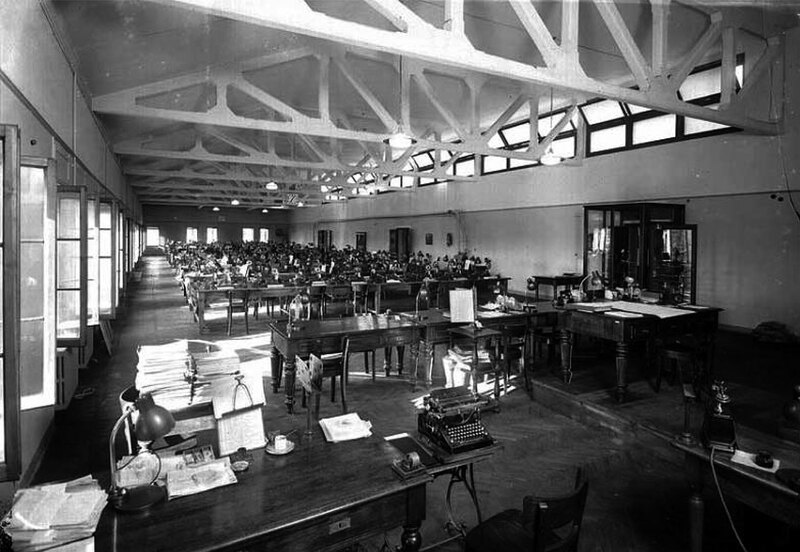 Il Fondaco dei Tedeschi, the telegraphs room with concrete trusses visible, 1940. Image courtesy OMA. 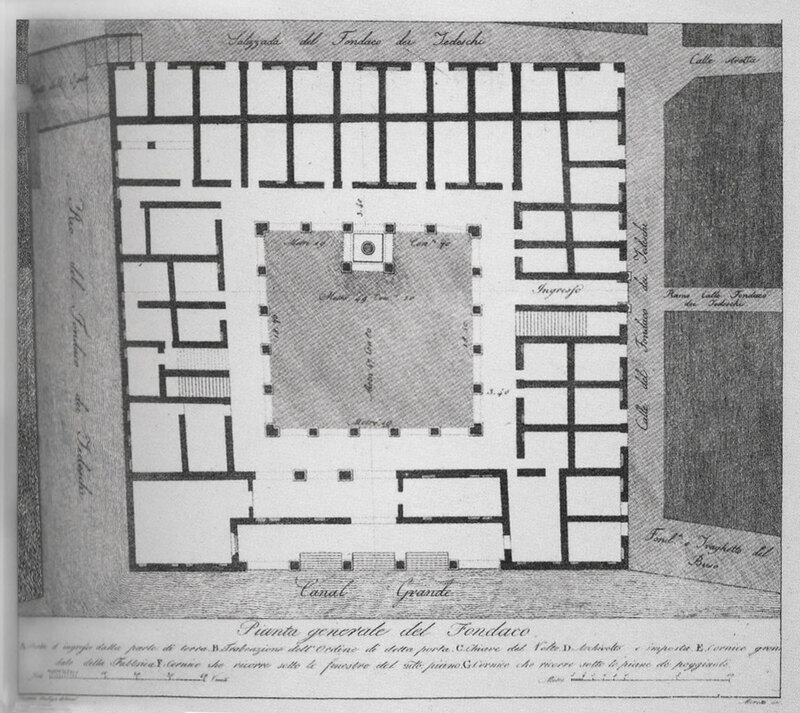 Il Fondaco dei Tedeschi, ground floor plan, 1505. Image courtesy OMA. 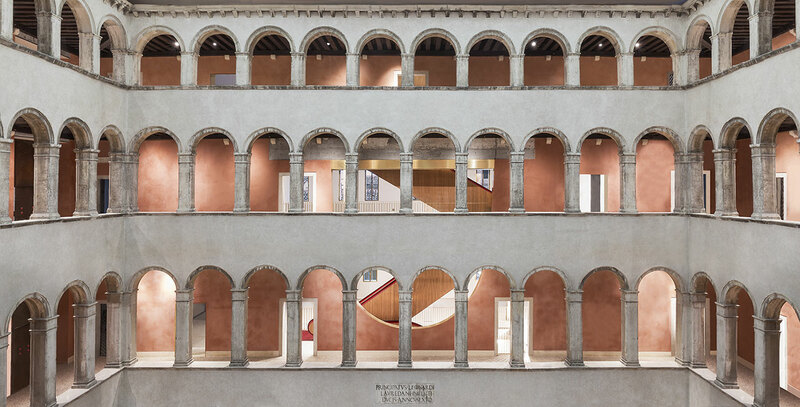 "The Fondaco’s renovation scheme is the outcome of a complex process which can be summed up in six years of creative negotiation with local authorities, national heritage institutions and local citizens." 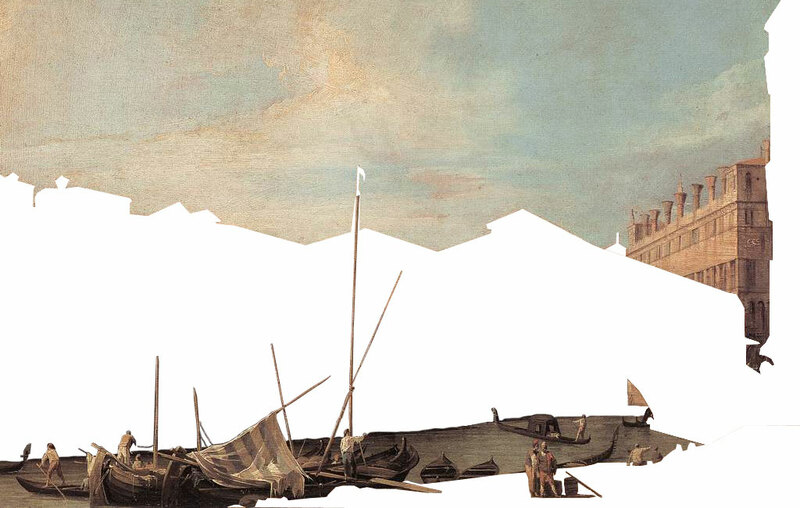 Painting by Giovanni Antonio Canal (Canaletto), 1727. Image courtesy OMA. 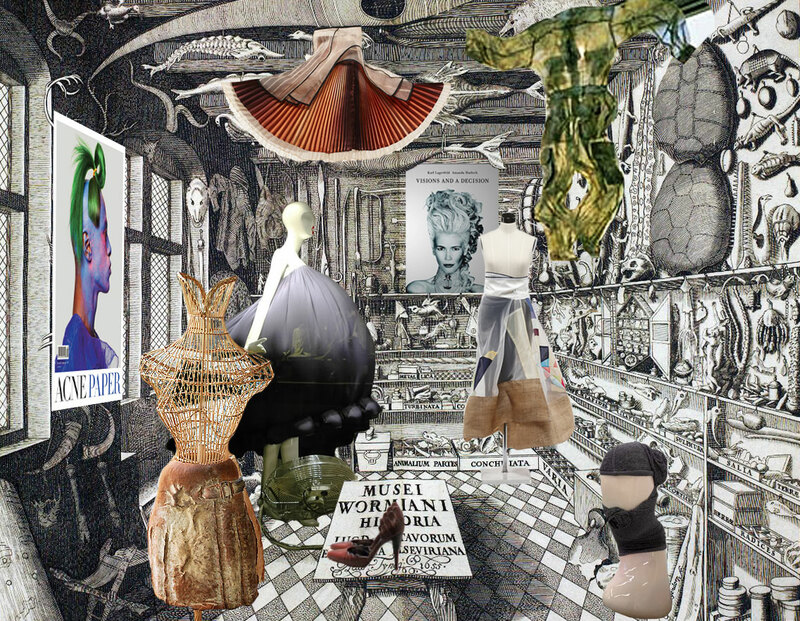 Il Fondaco dei Tedeschi, shops as small wunderkammers, early collage. Image courtesy OMA. 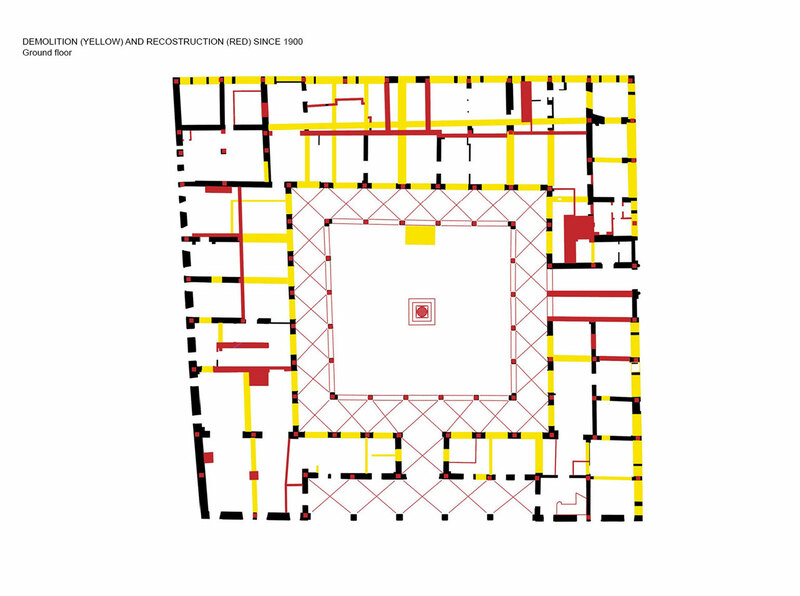 Il Fondaco dei Tedeschi, ground floor plan with demolition (yellow) and construction (red) since 1900. Image courtesy OMA. OMA is well known for fusing modern construction techniques with age old craftsmanship and melding the two in its projects. What are the innovations used on The Fondaco that had to be “tailor made” to suit this project? 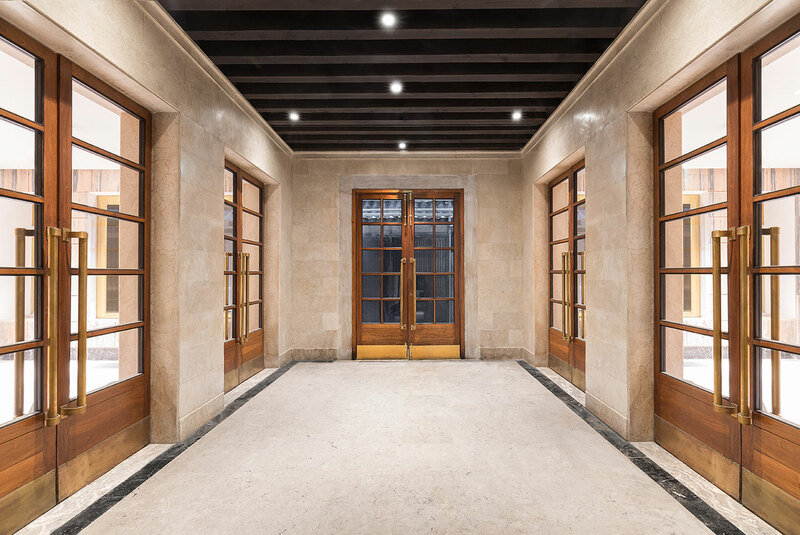 Almost every intervention in the renovation of The Fondaco is the result of a customized process where traditional materials have been introduced with a degree of innovation arising from experimental manufacturing processes or applications. 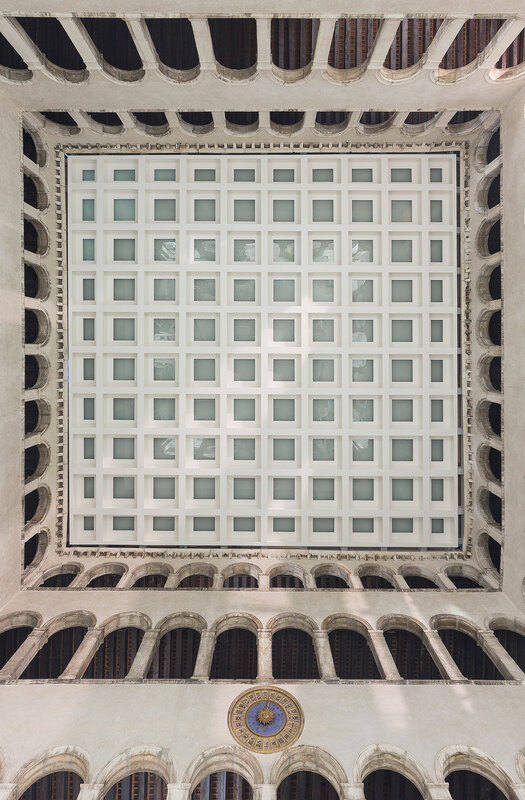 Examples of this process can be found in the iron gates along the gallerias, which combine OMA’s design with local craftsmanship, or in a reinterpretation of the traditional Venetian “red and white” pattern (an alternation of Istria stone and Rosso di Verona marble) for the new pavement in the courtyard. 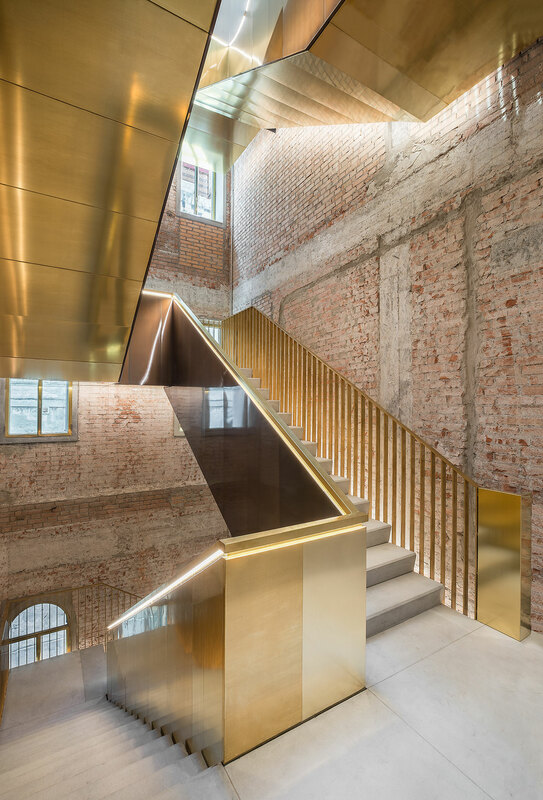 Brass is emblematic in this sense; it’s one of the materials that occurs most frequently in the Fondaco and it takes form in different configurations: as a cladding for the walls on the 4th floor, stairs, elevators, and window frames and as solid elements used to shape the new balustrades. It’s used in its natural state or turned into a colorful gradient through a special oxidation process which allows different shades, ranging from cobalt blue to light gold. Il Fondaco dei Tedeschi, longitudinal section showing new openings and cuts on the Gallerias’ walls. Image courtesy OMA. To create the new event space on top of the courtyard, the original structure has been completely dismantled, restored and mounted back. This part of the project definitely represents the most challenging intervention from a conservation, structural and architectural point of view. 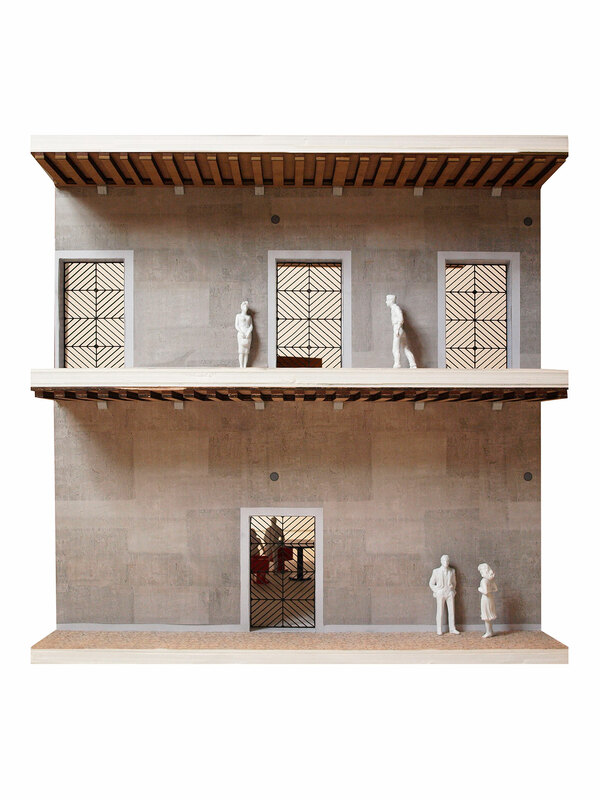 Il Fondaco dei Tedeschi, Gallerias with OMA designed gates, model picture. Image courtesy OMA. 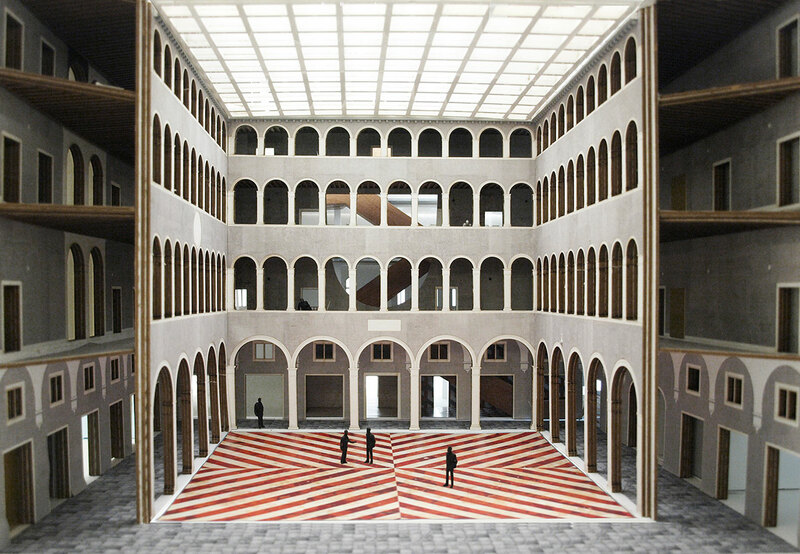 Il Fondaco dei Tedeschi, the courtyard with OMA designed floor pattern made of Istria’s stone and Rosso di Verona marble, model picture. Image courtesy OMA. What are the architectural interventions that proved the most challenging and which are you especially proud of? The new event space on top of the courtyard definitely represents the most challenging intervention from a conservation, structural and architectural point of view. It is the result of the transformation of the existing pavilion, a fascinating example of nineteenth century carpentry which originally functioned simply as a roof for the courtyard and wasn't accessible. The original structure has been completely dismantled, restored and mounted back. 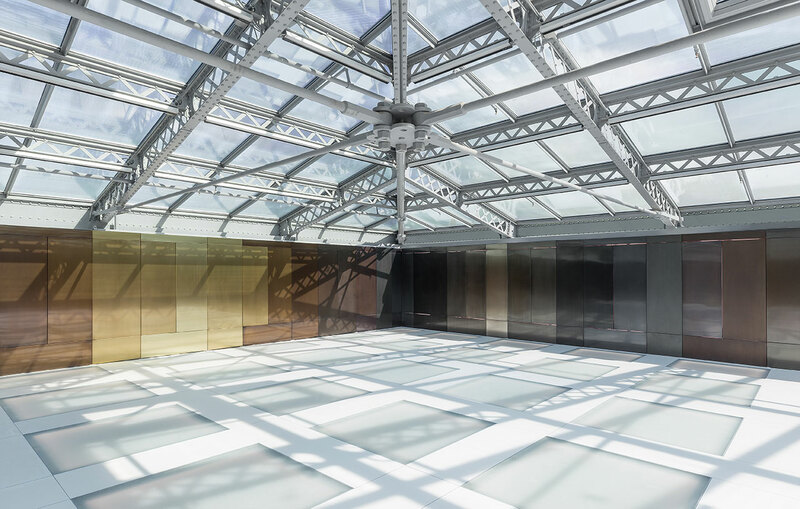 In order to make the new pavilion space accessible, the roof structure has been placed 1.6 m higher than its original position and is now supported by a new steel structure (the interior walls of the pavilion consist of moveable panels clad with different shades of oxidized brass and mirror). 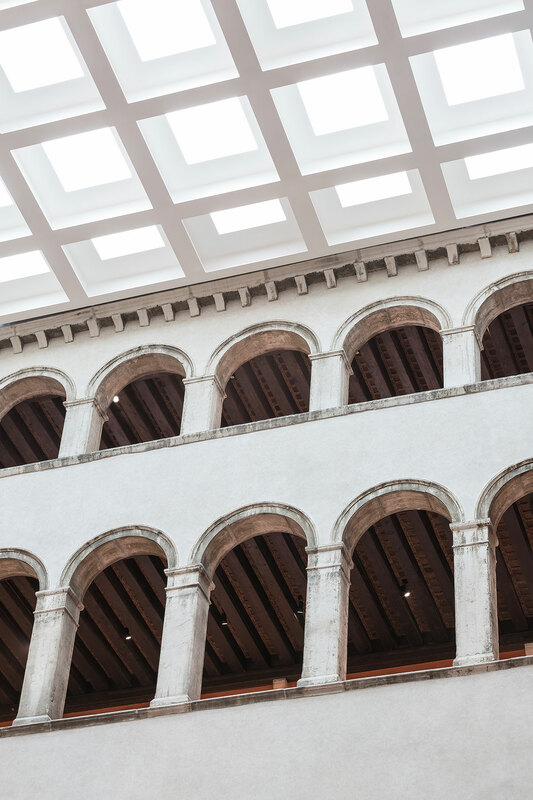 A new floor made of steel and glass has been added on top of the courtyard, which seen from the courtyard resembles a sort of contemporary version of a "cassettoni" ceiling. Its design required careful research, from a structural and geometric point of view, with the aim of finding a language compatible with the context and a 16th century building scheme. 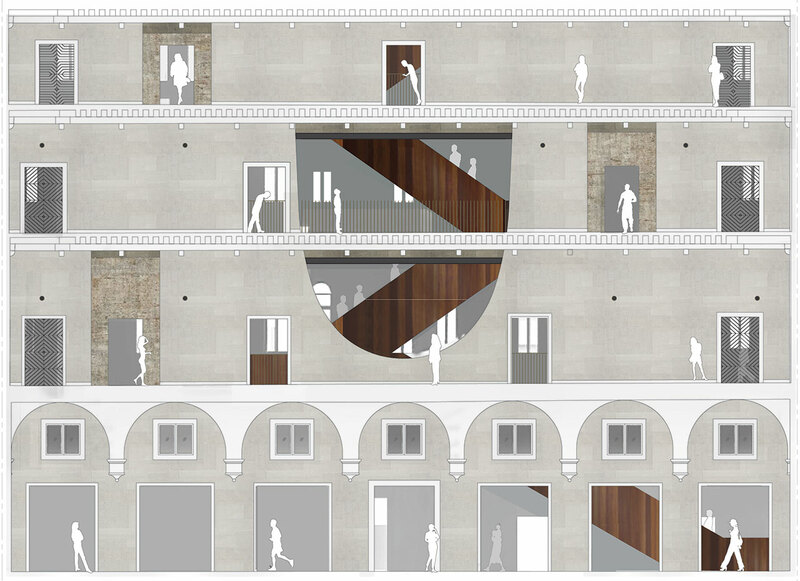 What would be the three elements of the renovation that you would urge a Fondaco dei Tedeschi visitor to look out for? 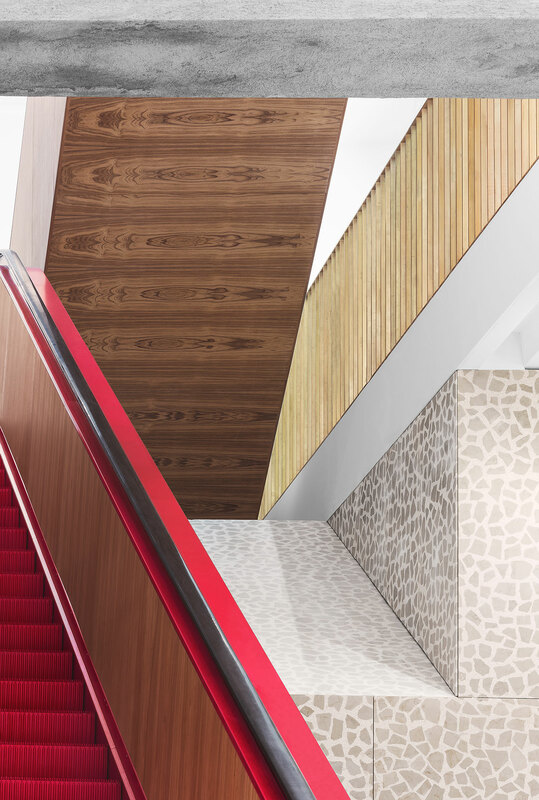 The escalators, not only as an architectural intervention per se, but as a symbol of the transformation of the Fondaco into a consolidated contemporary building typology. 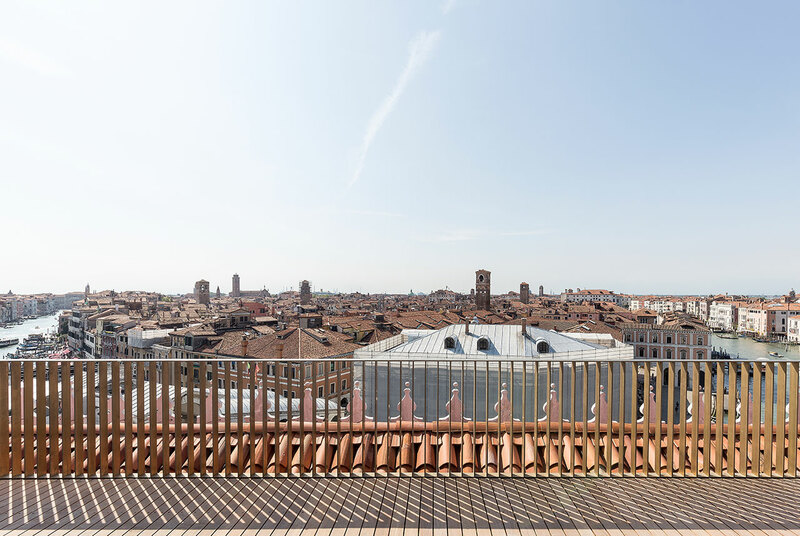 They are a technical element functional to the program of a contemporary department store, but also represent the project’s ambition to trace a new public route through the building, being able to directly connect the courtyard to the roof top. The escalators become an experience in itself; they unveil a unique point of view through the building which previously has always been experienced in a “horizontal” way. 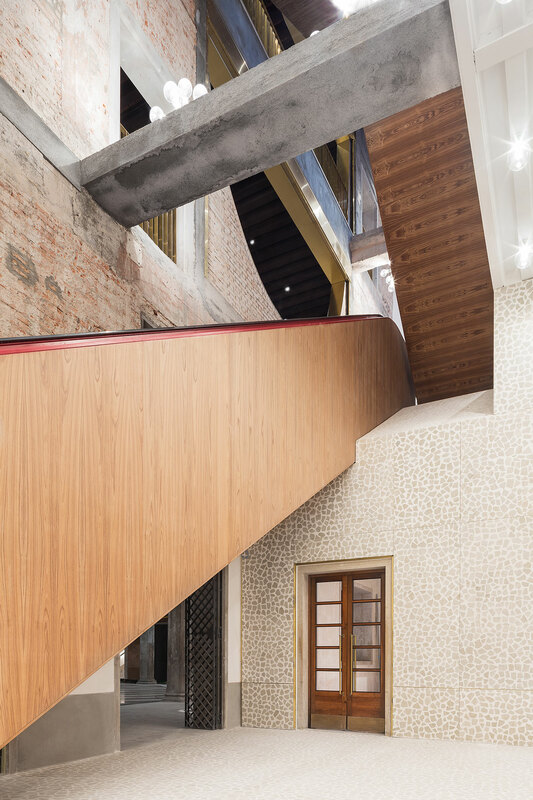 Then there are the new stairs which occupy a central room on the Calle del Fontego side which have been developed as an insertion through the building and are representative of the architectural intention of the renovation of the Fondaco. The stairs themselves are made of a steel structure hanging from a new concrete wall left exposed. They float in the space and never touch the existing walls which are left exposed in order to unveil the real substance of the building. 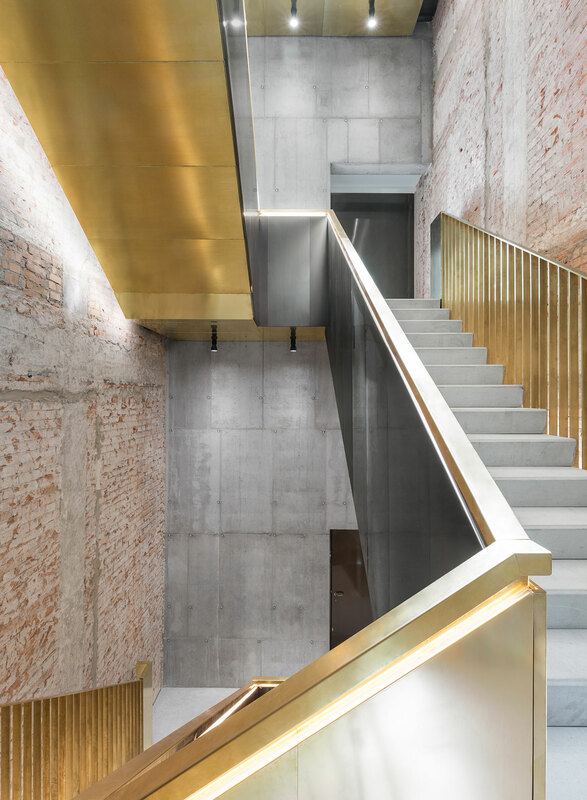 Brass recurs in its different configurations, in a natural and oxidized state, as a cladding for the balustrade and the structure of the stairs. Finally, there’s the sequence of unexpected spaces on the 4th floor (the corridor clad with brass and mirrors, the new event space on top of the courtyard) that culminate with the panoramic “Altana,” a steel and wooden structure built on top of the existing roof facing the Canal Grande offering a unique and unimaginable view of Venice. 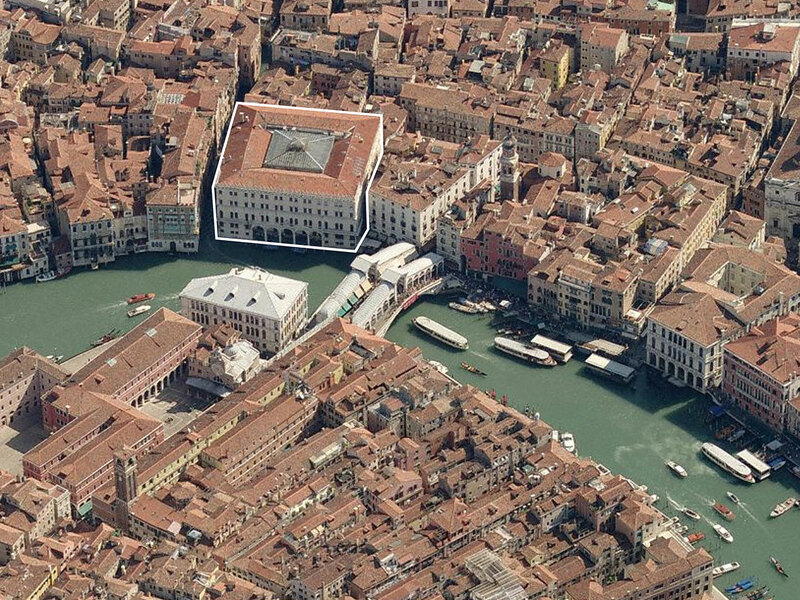 In your opinion, what does the renovation of the Tedeschi building mean for the city of Venice as a whole? What will it add to its future? When we first visited the Fondaco dei Tedeschi in 2009 we found a building that was semi abandoned. Only the first two levels were occupied by the post office and were partially accessible by the public. 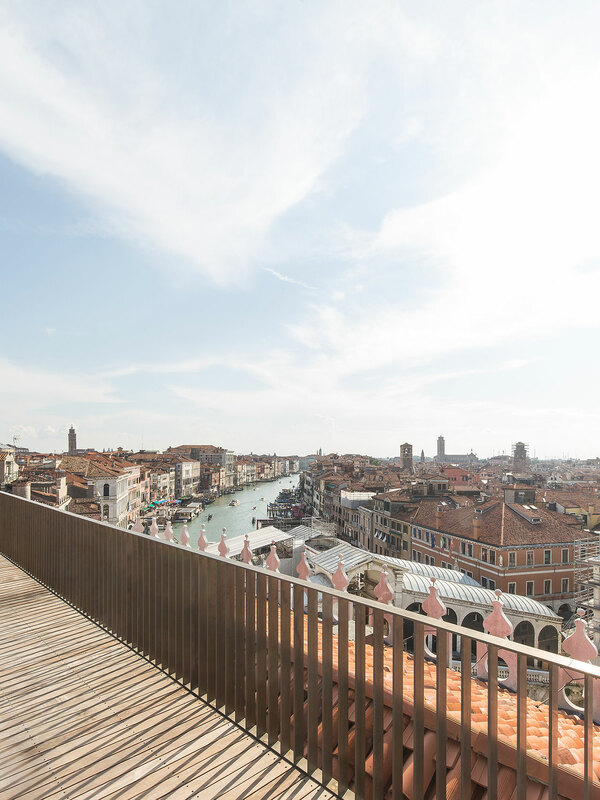 I think the biggest achievement of the renovation is the fact that the city of Venice, its visitors and most importantly its inhabitants, have been given the opportunity to experience, one of the most historically relevant Venetian buildings once again, and in its entirety. Il Fondaco dei Tedeschi, carved out terrace, early collage. Image courtesy OMA. 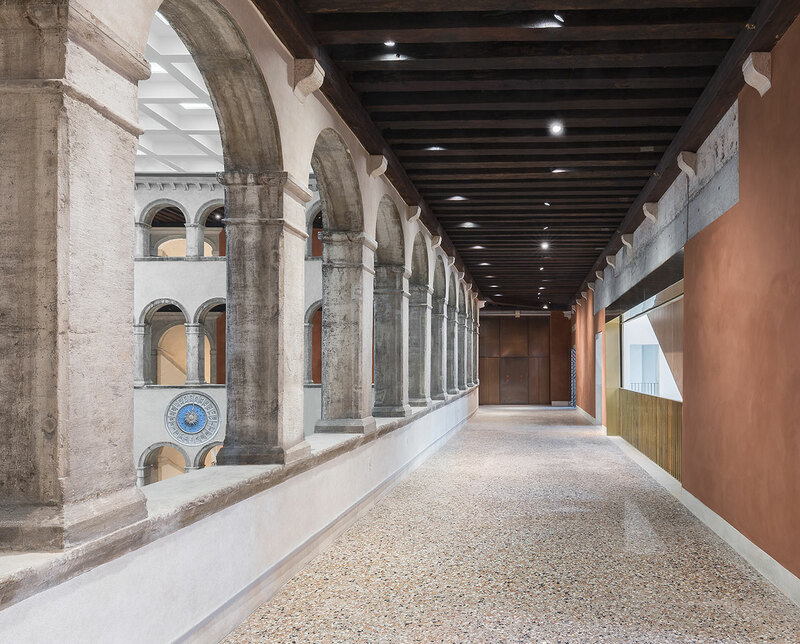 Through the Fondaco dei Tedeschi renovation, the people of Venice have been given the opportunity to experience one of the most historically relevant Venetian buildings once again, and in its entirety. OMA Lead Architect, Ippolito Pestellini Laparelli. Photo by Fred Ernst. Courtesy of OMA.